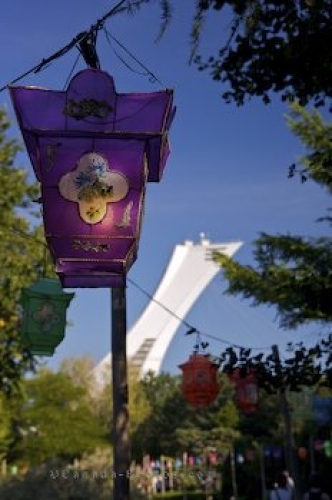 Colorful Chinese lanterns decorate the Chinese Gardens during the Magic Lanterns Festival at the Montreal Botanical Garden in Quebec with the Montreal Tower in the backdrop. Various colours of Chinese lanterns hang in a row around the Chinese Garden during the Magic of Lanterns Festival at the Montreal Botanical Garden in Montreal, Quebec. Each lantern was handcrafted with a different design as you can see on the purple lantern in the foreground. In the backdrop, a tall white building known as the Montreal Tower adorns the city skyline. Montreal Tower, and Lanterns in the Chinese Garden during the Magic of Lanterns Festival at the Montreal Botanical Garden, Jardin Botanique de Montreal, Hochelaga-Maisonneuve, Montreal, Quebec, Canada. Picture of the Chinese Lanterns at the festival at the Montreal Botanical Garden in Quebec.